Diabetes is an endocrine problem that is not only a major concern among humans, but also among dogs. Recent estimates place the prevalence of canine diabetes to be at 1 per 100 dogs which is sufficiently high. Diet and exercise play a crucial role both in its prevention and management. If your dog is already diagnosed with diabetes, it’s not too late to provide it with a diet that is especially formulated for diabetic canines. Our team came up with a listing of the best dog food for diabetic dogs to help you get started in your care for your pet. 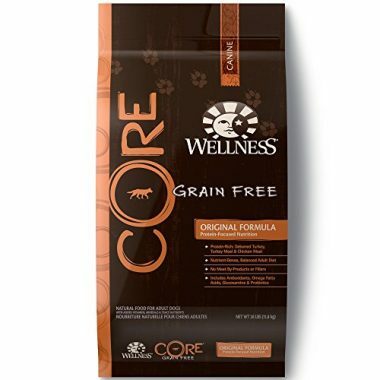 The Original Formula of the Wellness Core Natural Grain Free Dry Dog Food is not necessarily the best when it comes to dog diabetic diet since it has unusually high-calorie content on a per serving basis at 421 kilocalories especially when compared with the other dog food in this list. Nevertheless, its high-protein, moderate-fiber, and low-fat content still make it a highly favorable diet for hounds that have Type 2 diabetes. Majority of the calories are from its two meat ingredients, turkey and chicken, with the addition of the carbs supplied by a rich blend of healthy vegetables and fruits giving it an exceptionally high-nutrient profile. It also contains prebiotics and 4 strains of probiotics delivering 80 million CFUs for improved digestion. 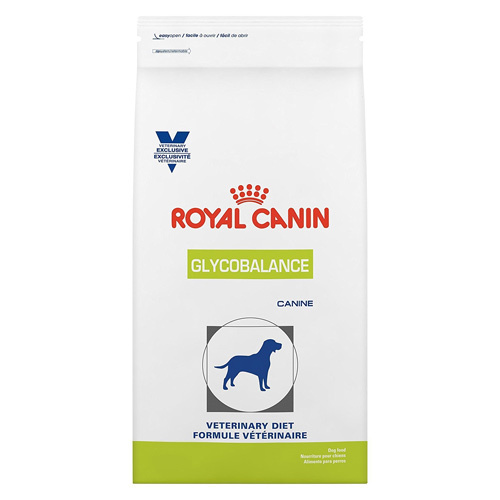 If you’re asking yourself “What can I feed my diabetic dog?” the answer would be Royal Canin’s Glycobalance formulation. It is low in calories and fat but high in proteins and fiber. As a matter of fact, Glycobalance has the highest levels of fiber in this list, allowing for better control of glucose absorption and utilization and minimizing abnormally sudden spikes in blood glucose levels. Do take note, however, that Glycobalance contains wheat and corn gluten as two of its first 5 ingredients. As such, it may not really be that enticing to pet parents who worry about gluten allergies in their respective dogs. Regardless, if the main purpose of a diabetic diet is better control of glucose levels, Glycobalance is simply incomparable. 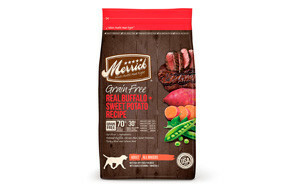 Four different meat ingredients highlight the Merrick Grain Free Real Buffalo-Sweet Potato Recipe. 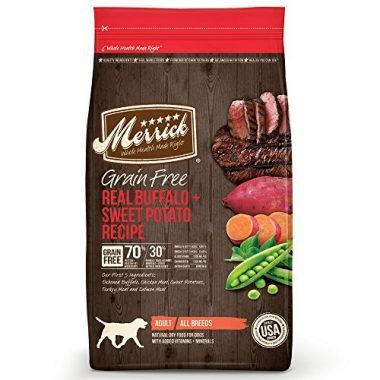 There’s buffalo, chicken, turkey, and salmon that provides the Merrick product with a rich source of EPA and DHA, two essential fatty acids that are known to modify canine diabetes risk. It also comes with glucosamine and chondroitin which can help obese diabetic dogs better carry their bodyweight without causing further strain in their bodies. Merrick’s formulation also features 4 different strains of probiotic organisms that can aid in better glucose absorption. Its fat content is also lower than most products while possessing the highest proportion of proteins in this product list. The best thing about Merrick dog food for diabetic dogs is that you’re actually giving your pet a highly palatable diet that helps it feed in a more sensible manner while addressing its diabetes. 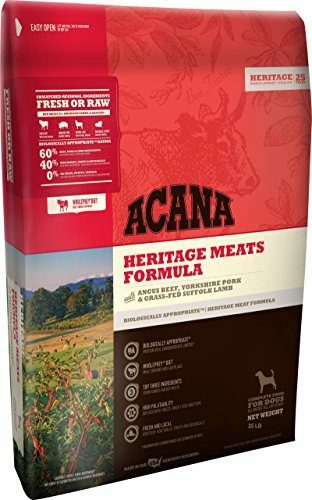 One of the best dry dog food for diabetic dogs is Orijen’s ACANA Heritage Meats. A 13-pound bag contains 1.33 pounds of fresh Angus beef, 1.5 pounds of fresh Yorkshire pork, and 0.67 pounds of fresh grass-fed lamb, all three of which account for 60% of the Heritage’s premium meat ingredients. The remaining 40% are sourced from fruits, vegetables, and botanicals. It may not have calorie content that is as low as Glycobalance, but it sure makes up for it by providing your pet with a biologically-appropriate, whole-prey canine superfood. It has one of the best essential fatty acid ratios of 1:3; whereas others mimic the typical pro-inflammatory ratio of 1:10 and upwards. 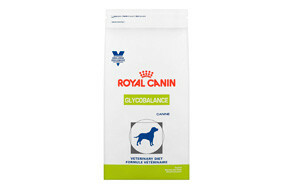 Glucosamine is also included to help strengthen the joints in dogs that may already be weighed down by obesity. When it comes to calorie content, the Heritage Meats may come up short. Still, it is a lot lower than the typical dog food. The low-glycemic index formulation of Dogswell Nutrisca is what makes it a recommended diabetic dog food. It doesn’t contain soy, wheat, corn, potatoes, and grains that may have the tendency to increase blood sugar levels within a short period of time. 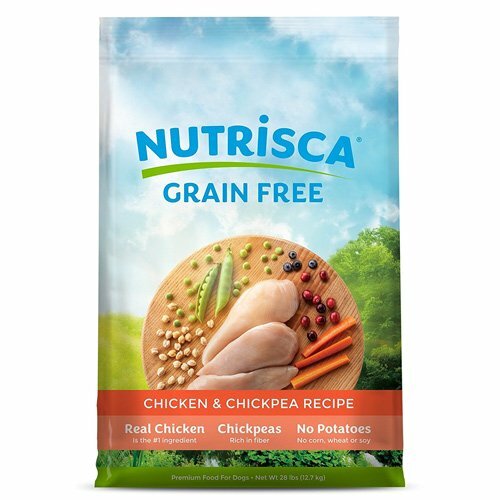 Additionally, the use of real chicken as its principal ingredient makes Nutrisca quite remarkable. Its moderately-high protein and moderately-low fat contents are helpful in helping the body better utilize stored glycogen in the dog’s body so that additional glucose in the diet can be easily absorbed and utilized by cells. It may not have the highest fiber content, but it sure gets the job done when it comes to taming sudden blood sugar spikes often seen in carbohydrate-rich diets. Diet is both the cause and treatment for diabetes. Dogs that have Type 2 diabetes often have faulty feeding patterns that lead to the accumulation of glucose in tissue depots that additional glucose can no longer be stored in these sites; hence, there is an increase in glucose levels in the blood. Just as faulty diet is to be blamed as one of the causes of diabetes in dogs it is also one of the most important treatments. Therefore, it is important to be especially mindful of several things when choosing a diet for your diabetic hound. The problem with Type 2 diabetes is that insulin is present, yet it is not doing its job properly. Somehow, it is now showing resistance in moving glucose from the blood and into the cells. This is not to say that insulin is no longer working to move glucose towards the cells. It still does, albeit at a very slow rate. What happens is that every time you feed your dog, you are adding to the glucose that is still present in its blood. This results in the abnormal accumulation of glucose in the blood, causing its levels to rise. This is where portion control comes in. As a rule, the amount of calories consumed should be equal or less than the amount of calories needed to do basic and complex physical activities. This is the whole idea about portion control. It is important to recognize the difference between soluble and insoluble fibers. Soluble fibers attract water which essentially turns the fibers into a mushy gel. This is what slows down digestion. On the other hand, insoluble fibers add bulk to the stool being formed in the gut, facilitating the more efficient removal of wastes. Obviously, what you would like to have is a high-fiber diet of the soluble kind. This can include oat bran, seeds, lentils, barley, nuts, peas, beans, and some vegetables and fruits. When you slow down digestion, you also slow down the breakdown of carbohydrates in food. This slows down the absorption of glucose from the small intestines and into the blood. Hence, your dog is able to exert better control of its blood glucose levels. Insoluble fibers like wheat bran, whole grains, and vegetables can also indirectly help in glucose control. Since these fibers are gut-expanders – they make the dog’s tummy feel full – they can help control hunger by improving satiety. As your dog’s gut is quite distended because of the presence of these bulk-forming fibers, the nerves in the gut do not send hunger impulses to the dog’s brain. In a way, it is a form of portion control. The glycemic index of foods is a reflection of the ability of carbohydrates present in food to raise the levels of glucose in the blood. Low-glycemic foods are known to release glucose in a steadier, albeit very slow manner. This this eliminates sudden spikes in blood glucose levels. Examples of low-glycemic foods include a great majority of fruits and vegetables, some whole grains, and legumes. Stay away from high-glycemic foods such as wheat, potatoes, and white rice. Additionally, it is best to go for complex carbohydrates than simple carbs as the latter can cause spikes in blood sugar levels. Fat is a necessary macronutrient for dogs; otherwise, they won’t have that silky-smooth coat of theirs. However, one of the major risk factors for diabetes is obesity. Given that fat contains an unusually high amount of calories, minimizing its consumption can help reduce the risk of diabetes. Too much fat in the diet has also been attributed to the development of pancreatitis or inflammation of the pancreas. Since the hormone that is responsible for the transport of glucose from the blood and into the cells is produced by specialized cells in the pancreas, any inflammation in the pancreas can also have an adverse effect on the production of insulin. As such, reducing the amount of fat in your dog’s diet can constitute an important aspect of canine diabetic diets. Compared to proteins and fats, carbohydrates are digested and absorbed a lot faster. This is also the reason why carbs are the best energy sources for any organism since they are easily processed and readily available. Unfortunately, just like what we illustrated in our example, too much carbohydrate has a strong impact on blood glucose levels after a meal. These can significantly increase blood sugar levels within minutes after consuming a meal that is rich in carbs. However, as we have already explained above carbs with low glycemic index as well as complex carbs are a lot slower to process. You can still maintain the carbohydrate content of your dog’s food; however, it is crucial that these carbs are of the complex type and have low glycemic indices. Among the three macronutrients, proteins have got to be the most difficult to digest and absorb. Thus, it takes a longer time for the digestive system to process this macronutrient. The effect is simple – it improves satiety, making your dog feel fuller longer. This also leads to a slower, gentler rise in blood sugar levels. The more proteins present in your dog’s food, the more time is needed for it to be processed completely. This leads to a longer-lasting feeling of fullness. Altering your pet’s diet is not really as easy as picking a bag of dog food that has the label “diabetic diet” on it. Unfortunately, there is a lot of misinformation in the market regarding these diets. So it is wise to get acquainted with the different types of diets for canine diabetes. The main issue with dry dog food is that it contains a lot of carbohydrate fillers of low- or poor- quality. Additionally, these don’t provide the right amounts of moisture that diabetic dogs need to address one of the classic manifestations of diabetes: polydipsia or increased thirst. While wet dog food provides exceptional moisture levels, they do contain a lot of preservatives and additives to help prolong the shelf-life of these commercially-prepared canned foods. In some cases, the protein included in the formulation is also of lower quality. In case you’re wondering why ancestral dogs didn’t have any problems like diabetes, this has something to do with their raw diet consisting primarily of meat and very few carbs. Raw, meat-based diabetic diets are rich in proteins and low on fats and carbs. One more thing, they don’t contain additives and preservatives since these are raw and very natural. It is quite rare to see a real prescription dog food for diabetes that has the nutrient profile we have been discussing so far – high in low glycemic and complex carbs, high in proteins, moderate to high in fiber, low in carbs, and low to moderately low in fat. The problem is that many of these so-called canine diabetic prescription diets are filled with certain carbs that can be converted into sugar, raising your dog’s blood sugar levels. 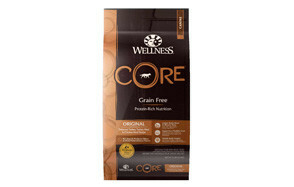 Based on what we have learned so far it is best to avoid dog foods that are rich in simple sugars. It is also important to steer clear of foods with moderate to high glycemic indices. Too much fat in your dog’s diet should also be avoided as this can lead to inflammation of the pancreas, contributing to a problem in the production and release of insulin from specialized pancreatic cells. Q: What is diabetic dog food? A: As the term implies, diabetic dog food is a pet food formulation that contains specific nutrient profiles appropriate for a dog with diabetes. These dog foods can have moderate to high protein content, low to moderate fat content, low carbohydrate content, and moderate to high fiber content. The same nutrient profile is expected of dog treats for diabetic dogs. Q: How often should I feed my diabetic dog? A: Diabetic canines should be fed twice a day. If it is receiving its insulin injections for the management of Type 1 Diabetes, it is equally important to schedule your dog’s feeding about 30 to 45 minutes before the administration of your dog’s insulin injections. Insulin is also given twice a day and is administered to move the glucose in the blood to the cells, reducing blood glucose levels in the process. Q: Can you see a noticeable difference in a diabetic dog just from diet alone? A: If a strict dietary regimen designed specifically for canine diabetes is adhered to, it is possible to see a noticeable difference in your diabetic dog. As we have mentioned above, one of the keys in managing diabetes is managing your dog’s weight. If you can reduce its consumption of glucose-containing foods relative to your dog’s activity levels, then you can see improvement in your dog. Sadly, the improvements you see may take a while before they are even noticeable. Adding increased physical activity or exercise into the management of canine diabetes can hasten the speed upon which these improvements can be observed. In our equation ‘energy taken in = energy spent”, diet addresses the first part of the equation. Exercise and increase physical activity addresses the second part. Q: Is dry food a big factor in diabetes? A: One of the biggest drawbacks of dry dog food is that many use low-quality carbohydrates as fillers in their formulations in an effort to reduce production costs while increasing profitability. There is this general observation that ancestral dogs did not have issues with diabetes. 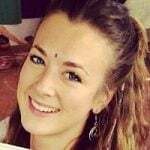 This was at a time when their diets consisted primarily of raw food, mostly meats. Since meat contains proteins and fats and no carbohydrates, this helped ancestral dogs avoid any problems with their glucose metabolism. On the other hand, many of today’s dogs are fed with dry dog food because it’s more practical and more convenient, too. While there are no empirical studies to show the causal relationship between dry dog food consumption and the incidence of diabetes in dogs, there is a generally held belief that such is the case. Q: Why won’t my diabetic dog eat or drink? A: There are two reasons why a diabetic dog won’t eat or drink. First, it could be because it simply doesn’t like the food that you’re giving it. Second, it could be because of ketoacidosis or gastroparesis. Ketoacidosis is a complication of untreated hyperglycemia in Type 1 diabetic dogs. This occurs because the dog’s body is unable to use the glucose present in the blood as there is no insulin to deliver it to the cells. To compensate, the body mobilizes fat for use as energy. Unfortunately, one of the byproducts of fat breakdown is ketones. This can lead to a loss of appetite in diabetic dogs. This is why diabetic dogs also need insulin for dogs. Gastroparesis is described as delayed gastric emptying or the food in the dog’s stomach is progressing very slowly. It is often the result of damage to the vagus nerve as a neurologic complication of diabetes. This can also make your diabetic dog not want to eat or drink. Q: Why is my diabetic dog losing weight? A: Weight loss is typical in dogs with type 1 diabetes wherein the pancreas is not producing insulin. Since cells are not receiving glucose, they starve. To compensate, cells must use other sources of energy: fat and muscle. Over time this can lead to significant reductions in body fat and muscle mass. This is what produces the loss of weight in diabetic dogs. Canine diabetes is a serious problem that is very common among certain breeds of dogs, although any dog can be affected especially those that are obese. Since diet is one of the major factors for the development of diabetes in dogs, it is natural that modifying your dog’s diet can also help address the issue. You can start with these best dog foods for diabetic dogs.